St. John of Kronstadt: He teaches the toll-houses according to Elder Ephraim’s Counsels From the Holy Mountain, p. 436. Fr. Thomas Hopko: “So, my opinion is that the teaching is that, when a person dies, a huge battle, it’s the last battle, in a sense, to see whether that person really does believe in God, and accepts the grace of God and the forgiveness of God, or whether they cling to their demons, cling to their sins and passions … it’s a very old teaching; you find the teaching about toll houses is in practically every Church Father: you find it in Saint John Chrysostom, you find it in John of the Ladder; the first development of it was in Saint Cyril of Alexandria. Vladimir Moss:“The doctrine of the toll-houses, of the particular judgement [sic] of souls after death, is indeed a fearful doctrine. But it is a true and salutary and Orthodox one. Let us therefore gather this saving fear into our souls, in accordance with the word: “Remember thine end, and thou shalt never sin” (Sirach 7.36). None of these Saints, holy elders, and respected theologians has relegated the toll-house teaching, based on the testimony of many Fathers, to the realm of mere theologumena and many included them in works of dogmatic theology. No Saint or elder has publicly rejected the toll-house teaching. Abp. Lazar and Fr. Michael have focused their polemical attacks on Fr. Seraphim Rose, claiming that he has mistranslated and misinterpreted Patristic texts, but obviously Fr. Seraphim is far from alone in his interpretation; and on the 10th century life of St. Basil the New containing St. Theodora’s vision of the aerial toll-houses, but several of the authors who have written extensively on the toll-houses, including Fr. Seraphim, Met. Hierotheos Vlachos, Constantine Cavarnos, and Archimandrite Vasilios Bakogiannis, and Nikolaos P. Vassiliadis, have done so without appealing to the authority of St. Theodora story which “contains nothing significant that is not to be found in other Orthodox sources on the toll-houses.” To debunk Fr. Seraphim and St. Theodora does nothing to debunk the toll-houses. Finally, it is claimed that the trials of the toll-houses make Satan equal to God in the realm of judgment. However, it must be remembered that God is always in charge, although He may sometimes use Satan and/or demons to accomplish His purposes. The most obvious example of this is the entire book of Job, in addition to Judges 9:23, 1 Kings 16:14 and 3 Kings 22:21-23 wherein God sends an evil spirit. Of those souls taken by demons Cavarnos writes: “They are not taken, though, against God’s consent and without divine concession, for God is the Lord of life and death.” Providing an interpretive context, Met. Hierotheos says that the demons are persons with free will who by permission of God and man’s allowance are able to dominate man through his passions and unrepentant heart, and that the demons have no authority over men of God. The demons only have as much power as we give them. In the forty days after death this conscious and active soul embarks upon a great journey, at times beautiful and at times frightful. This journey is clearly expounded upon by St. Macarius of Alexandria who received an angelic revelation. For two days the soul is free to wander accompanied by angels. Often the soul will stay near the body and virtuous souls will visit those places where they did good deeds. On the third day when the body is brought into the Church the soul receives some relief from its Guardian Angel because of the prayers offered on his behalf in Church. Following this teaching, St. John Maximovitch states that it is on the third day that the soul passes through the toll-houses. Having successfully passed through the demonic trials, souls are brought to Heaven to do reverence before God Himself in imitation of His Resurrection, and thus the Church offers oblations on the third day. Then the soul is shown the mansions of the Saints and the beauty of Paradise during the course of six days which allows it to forget all its bodily sorrows. After this the Angel again takes the soul to do reverence to God, and thus Church offers oblations on the ninth day. From the ninth until the fortieth day the soul is shown the horrors of Hades which cause souls to groan and gnash lest it be imprisoned there. On the fortieth day the soul again reverences God and only then does the Judge determine its fitting place. Thus the Church remembers the dead on fortieth day. Elder Cleopa teaches the same in his “The Soul’s Journey After Death.” Here it is important to note, as does Fr. Seraphim, that these numbers characterize simply a general rule – they are not dogmatic in and of themselves. Furthermore, this model in no way contradicts or negates the association of the third day memorial with Christ’s Resurrection, the ninth with the ranks of angels, and the fortieth with the period of lamentation over the Prophet Moses as is taught by the holy Apostles. And so, if by the verdict of the Righteous Judge the soul be given freedom, then immediately the enemies are put to shame, the luminous Angels seize the soul from them, and with no further obstructions it is led by the Angels to that unutterable joy and glory, to which it will finally be established. If, however, the soul lived carelessly and so was found unworthy of freedom, then it will hear that most terrifying voice: ‘Take this ungodly one away from here, that he see not the glory of the Lord’ (Isaiah 26:10. Here begins the “intermediate state” proper, when the soul will experience either a foretaste of Heaven in Paradise or a foretaste of Hell in Hades, which will last until the Dread Judgment enacted at the Lord’s return. As Cavarnos notes, many today intentionally speak of Paradise/Heaven and Hades/Hell as “states” rather than “places,” but he emphasizes that the Fathers, our hymns, and the Lord Himself refer to both destinations as places, although he clarifies that both “space” and “time” in the afterlife are not as we know them in the physical world. Fr. Seraphim, following St. John of Damascus’ teaching on the relative physicality of the soul, and St. Ignatius’ statement that “the location of paradise is in the heaven … the location of hell is in the bowels of the earth,” states that “these places and their inhabitants cannot be seen by men until their spiritual eyes are opened … Further, these places are not within the “coordinates” of our space-time system … They are not there, but in a different kind of space that begins right here but extends, as it were, in a different direction.” Vassiliadis teaches the same, but Met. Hierotheos is among those who says that these “places” are used to denote a particular way of life, although he does also refer to them as “noetic” places. There are various other means by which the faithful may benefit the departed: through offering charity to the poor on their behalf, the lighting of the candles and oil lamps (which constitute a kind of prayer), and the offering of alter-bread, wine and oil for the performance of the Holy Liturgy. Of course no offering is greater than the Eucharist on the behalf of the departed. However, of charity on behalf of the departed the Apostolic Constitutions teach that “These things we say concerning the pious; for as to the ungodly, if thou givest all the world to the poor, thou wilt not benefit him at all. For to whom the Deity was an enemy while he was alive, it is certain it will be so also when he is departed; for there is no unrighteousness with Him. For ‘the Lord is righteous, and has loved righteousness (Ps. 6:7).’” And here it must absolutely be noted: the Church in no way guarantees the salvation of any soul through its prayers and deeds – nothing replaces repentance in this life! Each man ought to throw himself at the mercy of God in this life and not rely on prayers offered after his repose. This would be folly. Thessaloniki: Holy Monastery “Evangelist John the Theologian, 2002. St. John Maximovitch. “Life After Death: A Homily by St. John the Wonderworker.” Footnotes by Fr.John Mack. 25 Feb. 2012. <http://orthodoxinfo.com/death/lifeafterdeath.aspx>. Words from Elder Paisios the Hagiorite: The Trials of Our Life, Holy Monastery “Evangelist John the Theologian: Souroti, Thessaloniki (2002), chapter 1, quoted in Greek at https://www.facebook.com/groups/167340509648/. See also Athonite Fathers and Athonite Matters, pp. 151-152. Tlingit Herald, St. Nektarios American Orthodox Church, Seattle, vol. 5, no. 6:3-9, p. 19, qtd. in Fr. Seraphim Rose, Life After Death, p. 237. “Death as a Good,” in Seven Exegetical Works (Fathers of the Church Series vol. 65), 4:15, p. 80, qtd. in Fr. Seraphim Rose, Life After Death, p. 177. First Conference, chapter 14, in the Works of St. John Cassian the Roman, Russian tr. by Bishop Peter, Moscow, 1892, pp. 178-179, qtd. in Fr. Seraphim Rose, Life After Death, p. 178. So glad to find this on here! And I saw thrones, and they sat on them, and judgment was committed to them. Then I saw the souls of those who had been beheaded for their witness to Jesus and for the word of God, who had not worshipped the beast or his image, and had not received his mark on their foreheads or on their hands. And they lived and reigned with Christ for a thousand years. But the rest of the dead did not live again until the thousand years were finished. This is the first resurrection. Blessed and holy is he who has part in the first resurrection. Over such the second death has no power, but they shall be priests of God and of Christ, and shall reign with Him a thousand years (Revelation 20:4-6). As the first human beings died spiritually before experiencing physical death, we are healed and transfigured first spiritually and then physically in God’s Holy Church; the Body of Christ. This healing and transfiguration is a process not unlike the therapies applied by modern medicine. There are three steps necessary for restoration to spiritual or physical health. First we must have a diagnosis of the cause of our illness or injury. This is followed by a treatment or therapy which corrects the cause, thus allowing healing to take place. Finally a change of life choices to help avoid a recurrence of the illness or injury in the future. The Church, as the Ark of Salvation, accomplishes all these things. She has diagnosed the cause of mankind’s terminal condition as sin, an infectious condition contracted from Satan and his demons. This fatal disease kills by disrupting the life giving and sustaining energies of God. First it kills the spirit and then it kills the body. The only known successful treatment for this condition has two vital elements. The first element is repentance, a course change in life that puts distance between the patient and the source of the pathogen of sin – Satan and his demons. 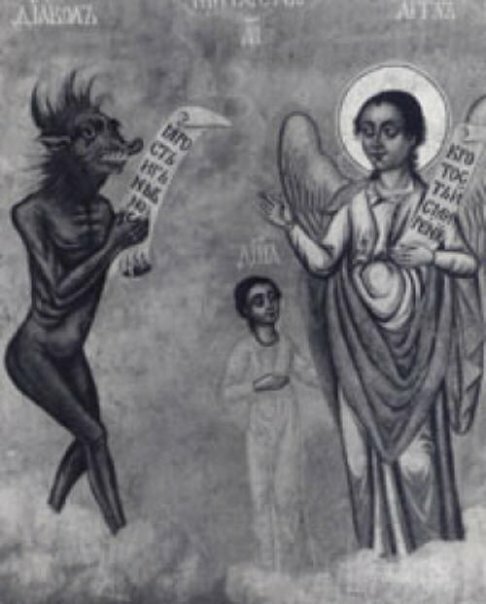 This repentance is realized in striving to resist Satan‘s influence upon one’s thoughts and actions: “who had not worshipped the beast or his image, and not received his mark on their forehead or on their hands.” The second element is the Mystery of Baptism into God’s Holy Church, this puts to death the selfish life, and washes away the sins that were disrupting the flow of life giving energies from God. To maintain the patient’s health, they are sealed with the gift of the Holy Spirit in the Mystery of Chrismation and given the medicine of immortality in the Mystery of the Eucharist. This insures a continued flow of God’s life giving energies that will increase as they are shared with others through acts of love and mercy. If there is a re-infection, the patient must renew the cleansing of Baptism through the Mystery of Repentance and then resume reception of the Eucharist, continuing to share God’s gifts through acts of love and mercy. If this regimen is maintained until the departure of one’s immortal soul and healed spirit from their mortal body, a condition known as the first resurrection will be realized. This spiritual reality is to live and reign with Jesus Christ in Heaven until the fullness of the symbolic thousand years is complete. When our Lord Jesus Christ inaugurates the Day of the Lord, the final resurrection assures an eternal joyful life in a glorified physical body, living and reigning forever with God the Father, Son, and Holy Spirit in the New Jerusalem and on the new earth. From the beginning of the Church age on Pentecost in A.D. 33 the one holy catholic and apostolic Church has been in spiritual warfare with the evil powers of darkness; Satan, and his demons. That the Church is clearly winning this war is not always appreciated from our earthly perspective. But from a Heavenly perspective, the continued growth of the Church in Heaven is conclusive evidence that our Lord God and Savoir Jesus Christ has indeed vanquished Satan and death.